Now in Friday's semi-finals, Federer will face sixth-ranked Tomas Berdych, a player who has won four of their past seven meetings, including two in Grand Slam competition. Not surprisingly, second-seeded Federer will go into the match-up wary of a potential upset. World No. 2 Federer leads Berdych 11-5 in their FedEx ATP Head2Head series, but the Czech won their most recent encounter in the US Open quarter-finals last year. Third seed Tomas Berdych saved three match points to knock out second seed and five-time champion Roger Federer on Friday at the Dubai Duty Free Tennis Championships for a place in the final. Berdych recorded his fifth win in his past eight meetings over Federer with a 3-6, 7-6(8), 6-4 victory in front of 5,000 tennis fans at the Dubai Tennis Stadium. The match lasted two hours and 20 minutes. Berdych will next look to improve a 1-12 FedEx ATP Head2Head record against World No. 1 and three-time former Dubai titlist Novak Djokovic in Saturday’s title match. Berdych came under pressure at 3-4 in the first set, dropping to 0/30, and went onto lose his serve after two deep forehands from Federer got the Czech off balance. Federer closed out the 38-minute set with a service hold to love. In the second set, Federer was broken at 2-3, 15/40, when he snatched at a forehand, hitting the ball into the net. Berdych confirmed the break to love for a 5-2 lead. Berdych, who has strengthened his core during the off-season and is a better mover around the court, served for the set a 5-3 but two forehand errors helped Federer get back into the pair’s 16th meeting. Federer was able to convert three break point opportunities at 5-5 and was later forced to save one set point at 5-6, 30/40 en route to the second set tie-break. The Swiss opened up a 6-4 lead, courtesy of Berdych errors, but some clever service placement got the Czech another set point at 7-6 in the tie-break. Federer’s third match point chance came and went at 8-7, before Berdych converted his third set point opportunity with a forehand return winner off a second serve. Berdych broke Federer to 30 at 2-2 in the deciding set to silence the majority of the supporters. Under enormous pressure, Federer played aggressively in the seventh game and saved three break points. Berdych recovered from 0/30 at 4-3 and then squandered his first match point opportunity in the next game with a forehand into the net. Federer saved a second match point with a powerful first serve. Minutes later, when serving, Berdych closed out his 14th match win of 2013 to reach his second ATP World Tour final in as many weeks. Six days ago, he finished runner-up to Jo-Wilfried Tsonga in the Open 13 final at Marseille. “Obviously I leave this match with a lot of regrets," said Federer. "I'm feeling... serving for the match, with the serve, having chances in the beginning of the second, when he wasn't quite in the match yet, to go break up, [a] set and a break. [There were] a few points where things just didn't happen for me. For the first time in the Dubai Duty Free Tennis Championships 21-year history the top four seeds featured in the semi-finals. Q. You must be very pleased with that. TOMAS BERDYCH: Yes, definitely I am. I mean, I couldn't be better feeling than this one, you know, coming from court playing Roger I would say almost in front of his home crowd, I would say that (smiling), you know, and to be the one who won that match. It really feels great. I'm very pleased the way I played today. Q. What were you thinking when you were down those match points? TOMAS BERDYCH: Oh, well, I mean, I already have some experience with him, especially with him with some match points down, and then being able to turn the match the other way. So, you know, I was always ‑‑ in every single point I was believing myself, you know, trying to be just focused on that single point and doesn't want to see the score and just go one by one. And again, it worked. It's the kind of tactic that I will try to stick with and try to bring it for every single match. Q. What is it about your game that he finds difficult? Because you have beaten him five out of the last eight. TOMAS BERDYCH: Well, I would say that, you know, the conditions also helped me or ‑‑it suits to my game, you know. Because in the beginning he was trying to coming more to the net, which I didn't see with him that often, you know. I know that he can play this, as well, you know. That's what is make him so dangerous, you know, that he can bring so many different styles. That's just show that he definitely doesn't want to play the rallies with me from the back, which, you know, when I play aggressive, that's something ‑‑when he doesn't feel that he has it in his hands, you know, that he can control the ball, he can do whatever he wants, then, yeah, that's what he like. But, you know, once he's in the other side and he needs to be defensive, that's probably what's make him, you know, that's what I can make the points with. Q. In Marseille you had match point against Tsonga. Did you think about that during the tiebreak? TOMAS BERDYCH: No, definitely not. But, you know, I can tell you that this feels much better than the one I ‑‑ you know, I wouldn't change anything. I'm happy with the way how it is. Q. You mentioned the crowd. Does it give you any extra incentive when all the crowd is rooting for the person on the other side? TOMAS BERDYCH: No, no, no. I was just saying it a little bit in the easy way, you know. Don't take me too straight, you know. It's just how it is, you know. It doesn't matter where he comes. Then he's gonna always be the huge Roger, you know. That's how it should be. So it was just that I said that. No, I think it was nice. I think they enjoy it, and it was really nice to be part of it. Q. Are you envious of the adulation that he gets wherever he goes? TOMAS BERDYCH: Oh, no. It's belong to him. I mean, he created it since beginning when he played, and after those results, how he's behave, his personality, he definitely deserve it. So it's absolutely right. Q. How does it feel to play Djokovic in the final? But the feeling that I'm in the final is great. Q. What makes Djokovic so tough for you? TOMAS BERDYCH: Yeah, that's something what ‑‑ you know, I think it's something not similar but it's the way Roger doesn't like my game and I don't like Novak's game. I will have homework for tonight to try to find out something what's could work at least a little bit, because the last, I don't know ‑‑I don't even know the high number to say that, that I lost to him. So basically, no, I mean, he's one of the best‑moving players I've ever seen, especially on the hard court. It's just incredible what he can get and especially when he gets there what he's able to play from that position. So this just makes him very, very tough to play. So, you know, I will try to ‑‑I will try to be patient. The court is very fast, so it could help to my strokes. You know, hopefully I will be able to bring my serve, which I was able to serve at least in the third set. Let's see. Let's wait for my chances. Q. It's 12‑1, but your win did come on the fast surface at Wimbledon. 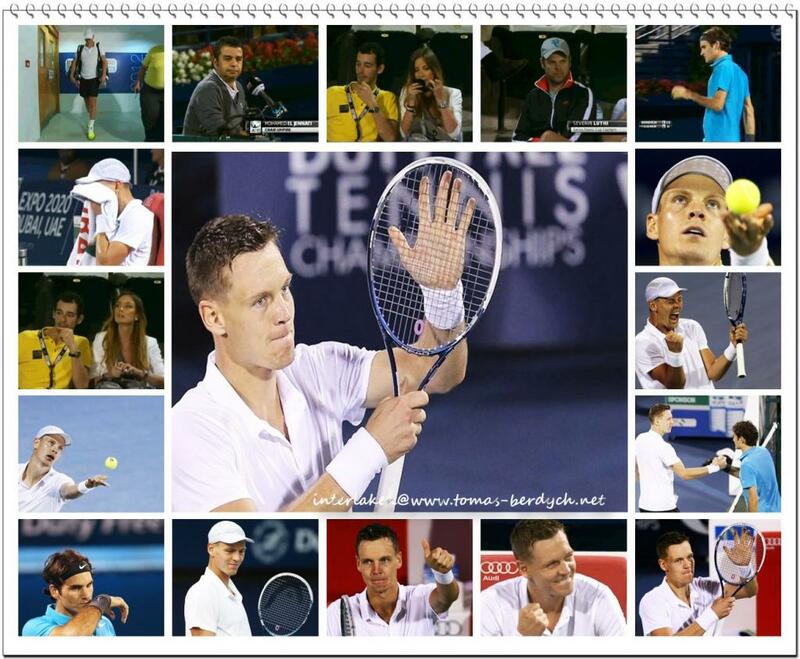 TOMAS BERDYCH: Yeah, that's a pretty, at least, small thing and positive thing that I can look for. But, yeah, as you said, you know, the score is not very good. But at least I have a "1," and I will try to bring second one tomorrow. Q. You have had a lot of matches in the last couple of weeks, three‑setter tonight. How are you feeling physically? Are you in perfect shape, do you think? TOMAS BERDYCH: Yeah, I still feel pretty well. I mean, it's nothing hurt in my body, and especially after every single match that you win, you know, you get the extra confidence that, you know, just puts all the tiredness out until you feel much better after that. So, yeah, I mean, I will do my same thing what I'm used to do after every single match, try to relax, prepare for the next one and same routine. Yeah, I feel really good.